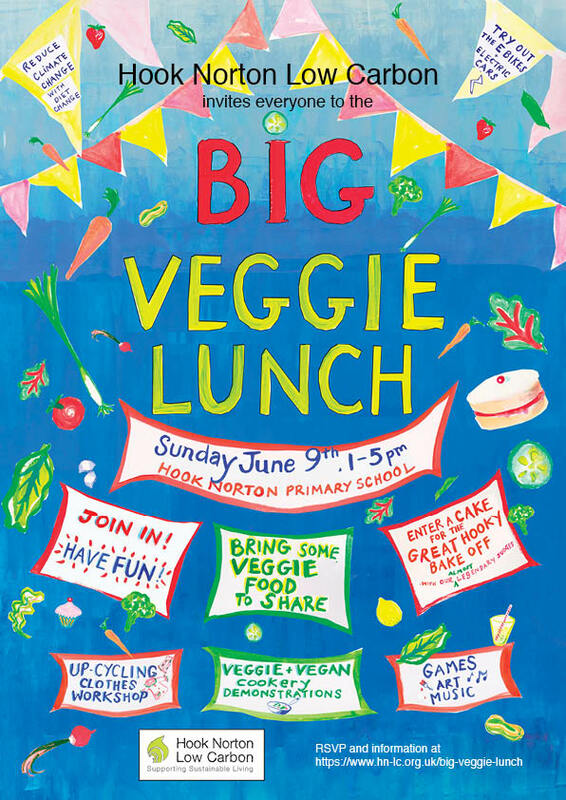 Hook Norton Low Carbon are holding a BIG VEGGIE LUNCH on Sunday June 9th at Hook Norton Primary School and EVERYONE is invited. Please bring a vegetarian or vegan dish to share if you can…but don’t worry if you can’t, come anyway as there should be enough to go round. We’re hoping for a dry sunny day so we can get together, share food & drinks and have fun. If it rains we will be in the school hall and under well placed gazebos. We’ve all seen the recent reports stressing the need to change our diet by reducing meat consumption and increasing our intake of plant based food to decrease green house gases. We’ve decided to spread the word and have fun all at thesame time. Sometimes it’s hard to know where to start but there will be veggie and vegan food demonstrations with recipes that will be easy to cook at home. Enter a cake in the GREAT HOOKY CAKE OFF selected by our (almost) legendary judges. Who will be Hooky’s STAR BAKER? Take part in an Up-cycling of clothes workshop. Bring an item and transform it with a few cleveradditions. Great fun for kids. Test drive an Electric Bike or the Car Club Electric Car. Reduce Waste-Food workshop from Replenish, Oxford. Music, Games, Food, Stalls, Fun.